Golf Game Interactive – When it comes to golf, you're going to need an even swing, a consistent drive, a short game with immense finesse, and that docile putting game that's soft and highly calculated. But, let's be honest. Sometimes you want to take the biggest club you have and rip a drive as hard as you possibly can. Now, that dream is a reality right in the middle of your own birthday party, social event, or corporate get together, with the About to Bounce Golf Game Interactive. This inflatable 15' x 15' set up has realistic graphics – so you feel like you're right on the course. Pre-placed holes make for a competitive game that will have many partygoers wanting to take a swing. 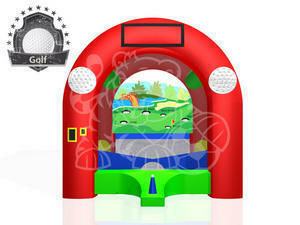 Priced at $114.95 for a five hour rental, the About to Bounce Golf Game Interactive will be a genuine hit. At least for now, your guests can pretend that they don't have any sliced at all.